I never realized that there were women doing these beautiful design blogs until recently. I am actually so obsessed with natural childbirth that it is pretty much the only thing I ever read about online. Other natural birth bloggers and ACOG press releases are pretty much my "me time." Yes I realize how sad that is. So I was stunned to realize recently that there is this huge secret society of design blogs in which people take pictures (rockin' professional looking pictures) of their beautiful children, their immaculate homes, and their handsome husbands and --- people read them! Still, here are the things that stick me in this category....forever. They don't actually look as bad as the one above. I don't spend THAT much time on Facebook. Actually, they look pretty good right now. This is not however due to me, but to my sister- in- law who COULD have an awesome design blog. She makes her own children's clothes, decorates for Christmas, and makes things out of string and glue. She also knows how to make walls look great and does this while on vacation. But alas, I don't notice stuff on the walls until people come to visit and start cleaning it. I am THAT kind of mom. And I have never decorated my house. Pretty much NEVER. Maybe someday. My husband threatens that he will have his mother do it. That my friends, is not happening. So I did realize that somebody had written on my wall. It was the four year old. "Did you do this?" says mom. "No. It was the two year old!" says the four year old. "She can't reach that high," says mom. What does this little exchange illustrate? That I have dirty walls and kids who will lie to cover their butts, even throwing younger children under the bus to avoid whatever (apparently awful) thing I have in store for them. Other awesome bloggers have ninja like parenting skills. They don't get mad and their kids admit stuff and don't write on walls because they have had respectful discussions about not doing that. I don't even know how that works. Discussions about behavior with two year olds. Hmmm, can they involve the phrase, "Do it now! Because I said so!!!!" ? I just can't help it. I would love to write about the ways that I parent like a pro and how I manage to keep a marriage riding along smoothly. But that would be something of a.........big fat lie..... and so instead I just write about how things really go down. Messes, yelling, even spanking will be discussed here. I gave up on perfect parenting a long time ago. And marriage. Well, I am completely befuddled by this endeavor called marriage, despite the fact that I believe it is deeply sacred and important. When I figure it out, you will be the first to know. I take horrid pictures. I tried to take some at my brothers wedding. They handed me an expensive new camera and I did my best. Awful, truly awful; pictures resulted. They said it was OK- they had hired somebody for real to take pictures who had skills. I actually fear someday that my kids will ask for proof that I am their mother and all I will have to show them will be an empty baby book and 6 crumpled anonymous looking pictures. Plus, people online freak me out sometimes and I don't want them to have pictures of my kids. So- if you are still reading, thanks. I appreciate it. I know this isn't the most professional looking, proof read blog out there. But I like it and I hope you do to. Not every blog or family can be picture perfect all the time. You're not alone! My house is in chaos right now. The sad part is it was tidy yesterday. It sure goes to pot fast!! I find the simplicity and honest of your blog refreshing and real. Thank you! 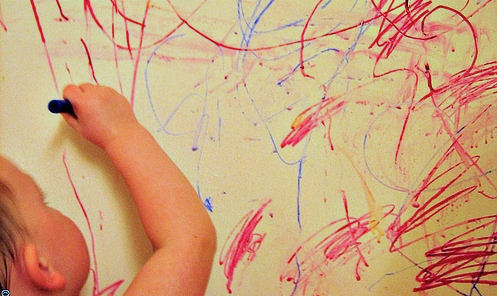 I really enjoyed reading this post, especially about your kids writing on the walls and making you not want to write about your parenting skills. Don't worry stuff like that happens to all parents, kids just do stuff like that, can't stop it but you'll look back on it one day and laugh that those were the days.